(Durham, NC) – April 1, 2019 – Triangle residents will have a new option for recreation when Bull City Mini opens in Durham on Saturday, May 11th featuring community-designed mini golf holes and a bar serving local beer, wine and frozen beverages for adults and kids. The seven-hole, indoor-outdoor course will occupy the former Bullpen space on Blackwell Street at American Tobacco Campus, adjacent to the Durham Bulls Athletic Park. The course will extend outside onto the patio, flanked by an outdoor living room to enjoy a drink before or after playing, or relax as spectators. Picnic tables, comfortable outdoor seating and murals by local artists Candy Carver and Britt Flood will encourage patrons to put down their phones and focus on the fun of being with friends and family. When Bull City Mini opens its doors on National Mini Golf Day, there won’t be any doubt as to the provenance of the project. Over fifty people submitted entries in the community-wide call for Durham-themed hole designs. Selected winners include a team of local middle school students, a ninth-grader from Chapel Hill, several working artists, a team of Duke medical school student, Triangle-based tech professionals and a handful of creative Durhamites inspired by the project. The holes aren’t just locally-designed either. Long-time Triangle fabricator and design shop, Point Concepts, is fabricating the holes. Point Concepts was founded by North Carolina State University industrial design graduate, Dan Schwab in 1992 to create branded environments, and museum and tradeshow displays. Their clients include Red Hat, Citrix, Blue Cross Blue Shield, UNC Rex Hospital and BASF. Golf at Bull City Mini will cost $7 with drinks and snacks offered a la carte. The team plans to add additional holes in the coming months as space allows. For husband-and-wife duo, Ben Owens and Julie Bryce, this project is a dream and side hustle two years in the making. Durham locals and both full-time working parents, chasing the idea of locally-inspired, community-designed mini golf has led them across the country, into partnership with bona fide mini golf experts who have consulted on other locally-conceived, artist-designed projects in Minneapolis, Indianapolis, Kansas City and Spartanburg, and now into their first ever foray into brick and mortar retail. Julie, a professional marketer, and Ben, an engineer and data scientist, started formulating a concept and then a business plan during those long stretches driving home to North Carolina. The course will feature seven community-designed holes by artists, students of all ages and members of the community. “We received over 50 entries in our call for hole designs. Narrowing the list to seven for this first course was difficult. The ideas were fantastic, but we weren’t surprised. This is our city and we know how creative its citizens are. 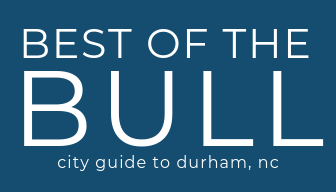 The people here are one of the main reasons we love calling Durham home,” says Julie. “We both work in tech and spend more time than we’d like to admit staring at a screen, so we’re committed to building a business that encourages offline recreation and fosters opportunities to reconnect with loved ones in real life,” says Julie. Bull City Mini will be an extension of the successful PopUp at American Tobacco program which has brought exciting new concepts to the campus via a rotating series of retail and restaurant experiments. Follow Bull City Mini @bullcitymini on Instagram!